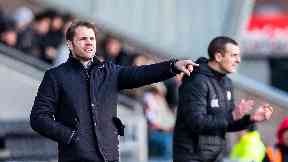 The Dundee United manager saw his side progress but had words for the referee. Dundee United manager Robbie Neilson saw his side knock St Mirren out of the Scottish Cup but said referee Willie Collum had ruined the game. United were 2-0 ahead when St Mirren's Paul McGinn crashed into Cammy Smith and Neilson was astonished that the Saints skipper wasn't sent off. Callum Butcher was then sent off for United and St Mirren clawed a goal back through Duckens Nazon, forcing nervy finish fort the visitors. Neilson said the game had turned on one call and Collum's failure to produce a red card set the tone for the second half. "I thought it was a disgrace," he said. "He saw it, the fourth official saw and watch it on the TV tonight. "The referee's decision not send Paul McGinn off made it a fight and a battle, everyone starts kicking each other and he tried to calm it down by sending one of my players off. "When you see the picture of it, the two of them have their legs up and he's probably seen my player going in and he's thought, 'I need to calm this down', because as soon as he doesn't send McGinn off, everything just escalates and they think they can get away with anything. "I don't really want to come and speak about referees because we are trying to calm it down, but it went from a really good performance from us to a physical game where it is just kicking each other and he decides to send someone off and it just a lottery after that. "Then it was backs to the wall, so I was disappointed with that side. "But to come to a Premiership club and dominate for a considerable 55 minutes was good." Defeated Saints boss Oran Kearney was disappointe dhis side couldn't produce a repeat fo the previous round, when they bounced back from two goals behind to win 3-2. "We left ourselves with too much to do," he said. "I told the players in my team talk we couldn't have another Roy of the Rovers like the last round. "Sadly for us that is how it panned out without the end product this time. "We possibly could have got a replay or more out of it on chances created. "But you can't keep expecting to win a game in Roy of the Rovers fashion."